We've compiled some of the healthiest drinks to have on hand to keep you hydrated, detoxed, and healing. 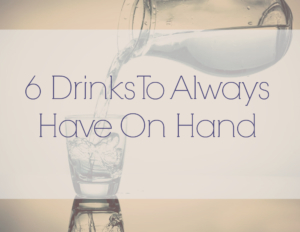 This may sound obvious, but how many times have you been out somewhere and felt thirsty but didn’t have water? Drinking water not only when you feel thirsty but also if you’re feeling bloated, tired, hungry, or have a headache can also help you feel better! If you’re kicking the soda (Even diet soda…Especially diet soda! ), water may seem a bit boring.. mix it up with some cucumbers, berries, or citrus and a bit of honey, stevia, or other natural sweetener you like. We’ve all heard of the antioxidant powers of green tea: metabolism and immune system boosting, energy giver, mood uplifter, and fat burner.. but it also can improve brain function and memory, may lower your Alzheimer’s and Parkinson’s risk, reduce infection and improve dental health. If you’re craving something sweet, fresh juice may be just the thing to quench that desire. Sometimes it may give too much of a blood sugar rise so be sure to balance it out with some greens in there, chia seeds, or a little snack that can help slow down the sugar rush. Chia seeds are also full of fiber and a few grams of protein per serving! Yes, those weird looking cactus plants that grow in some of our yards… the aloe juice aids digestion, helps skin and hair, and reduces inflammation. Drinking aloe juice also helps detox the body, aids weight loss, controls blood sugar, and generally helps balance and heal anything in your body! These healthy bubblies are full of probiotics and B vitamins which can help aid digestion as well as heal and maintain gut health. The acetic acid in them may help stabilize blood sugar. They are great if you’re not keen on alcoholic beverages (be aware they do contain natural alcohols from the fermentation). Fresh, delicious, hydrating, full of vitamins and minerals.. what could be better than something that with just one sip will transport you to paradise. Drinking coconut water may help with blood sugar levels, free radicals, blood pressure, heart health, and much more. With more potassium than a banana, plus the manganese, magnesium, folate, calcium and selenium it contains makes this a powerhouse choice!